BreatheFree2 is a free, web-based smoking cessation program that provides individuals with the option of going through a stand-alone program by themselves, or connects them with a facilitator-led program in their geographical area. It was launched in early July in Geneva, Switzerland, at the second Global Conference on Health & Lifestyle. Professors at Loma Linda University School of Public Health, Dr. Daniel Handysides, DrPH, and his wife Ms. Sandra Handysides, FNP, worked on the program in collaboration with the International Commission for the Prevention of Alcoholism and Drug Dependency (ICPA). “BreatheFree was a smoking program that came from the 1950s. 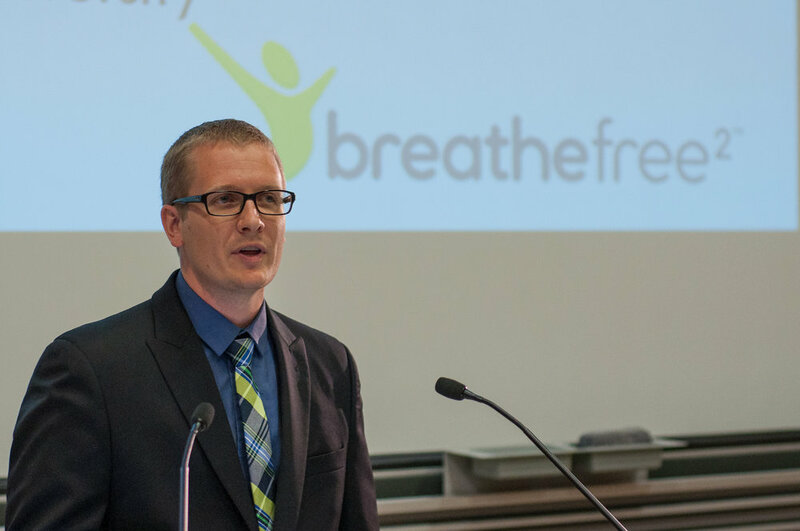 It was a five-day quit plan,” said Dr. Daniel Handysides, “We updated that to the latest evidence and have released it as BreatheFree2.” The difference between BreatheFree2 and other smoking cessation programs is that it emphasizes interpersonal relationships, and offers a network of support. The CDC states that “tobacco/nicotine dependence is a condition that often requires repeated treatments,” and Dr. Handysides added that BreatheFree2 is “there to make sure there is a relational support system to help them quit. What this program offers is a network of people that offer them support and guide them through the steps to help them lessen their withdrawal symptoms.” The program also offers individuals a way to connect with their primary physicians in order to incorporate a pharmaceutical element to their program if they are heavily addicted. BreatheFree2 is open for any organization who wants to utilize it. “This program was designed specifically for the fact that it will help people, and it will be free for them,” said Dr. Handysides. “We had 109 facilitator sites sign up within the first two weeks of being released,” he added. Facilitators from all over the world registered to participate in the program. “All the way from Papua New Guinea, Australia, Poland, Ukraine, South Africa, and multiple U.S. sites.” The next steps, Dr. Handysides said, include presenting this program to the World Health Organization. “We were approached by a collaborating partner with the WHO and they are interested in using this as the WHO’s occupational smoking program. This means [BreatheFree2] would be the approved program of the World Health Organization.” They are not there, yet, said Dr. Handysides, but they are currently working on a formal presentation. For more information or to sign up, visit www.breathefree2.com.